BACKGROUND: Information about plastic surgery procedures is becoming more easily accessible everyday as the influence of social media expands rapidly. Plastic surgeons may use these platforms to advertise their practices and facilitate patient education. This study aimed to investigate the online presence of South African plastic surgeons with regard to personal practice websites and social media profiles. Plastic and Reconstructive Surgeons in South Africa is steadily growing in demand as awareness amongst the general population grows on account of increased exposure to the profession via the media. The major avenues of exposure in this current era are the social media platforms which have become common parlance in daily life. Of these social media platforms, Facebook, Twitter and Instagram have established themselves as the primary platforms of the social media world. Increasing numbers of plastic surgeons are utilising these social media platforms for exposure of their practices as well as patient education regarding the various reconstructive and cosmetic procedures on offer. Montemurro et al.1 found that of patients seeking information on cosmetic plastic surgery, 95% were using the internet to obtain their information prior to an actual face-to-face consultation with a plastic surgeon. However, the conversion of these online searches into physical visits to a plastic surgeon remains to be assessed. Facebook is an online social networking service which also allows users to search for services (usually through "groups" or "fan pages"), obtain information, and provide or examine reviews for these services. Twitter is a social networking site that enables individuals and businesses to share information or thoughts via text posts known as "tweets." Twitter is a "microblog," through which users can tweet up to 280 characters at a time. Instagram is a mobile photo and video sharing application and service that allows users to share pictures and videos either publicly or privately on the platform. Instagram users are also able to link their shared media to other social networks, such as Facebook and Twitter. The first half of 2017 saw an information explosion on social media as plastic surgeons worldwide began to establish profiles across all social media platforms. A general search for the term "plastic surgery" yields an ever-growing plethora of profiles related to plastic surgery practices and surgeons. Many surgeons have begun using these platforms to enhance exposure to their practices by various means, including patient education through pre- and postoperative images, as well as intraoperative videos of various procedures, both reconstructive and cosmetic. This study aimed to assess and describe the extent to which South African plastic surgeons have an online presence on the internet and on social media platforms as described above (Facebook, Instagram, Twitter), as well as which surgeons had websites with links to their social media platforms. In addition, further aims were to determine if there is a predilection for online presence based on geographical location within South Africa, or related to time since attainment of their specialty. 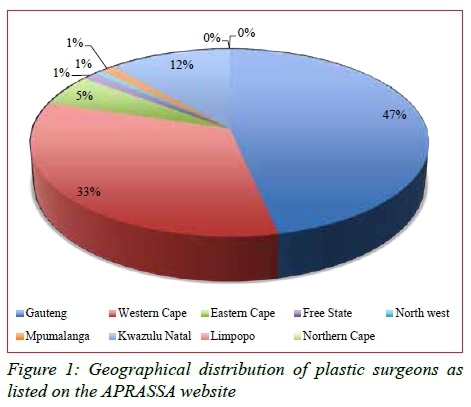 A list of registered plastic surgeons in South Africa was compiled from information on the Association of Plastic, Reconstructive and Aesthetic Surgery of South Africa (APRASSA) website, found under the Find a plastic surgeon link. Each plastic surgeon was searched for using the Chrome web browser and Google search engine, using the search terms "Dr" followed by the surgeon's name and surname as it appears on the APRASSA website. Those professional websites were then examined for links to social media such as Facebook, Instagram or Twitter. Websites were also examined regarding the nature of information available on the website. Websites and social media accounts/profiles belonging to joint practices of multiple surgeons were excluded. Personal profiles on Facebook, Twitter and Instagram were also excluded. All data was collected from publicly accessible websites over a period of two days in July 2017. The total number of South African plastic surgeons whose information is listed on the APRASSA website totaled 148 at the time of collation. Of those, only 3 surgeons (2%) had direct links to their personal website on the APRASSA listing. In total, 64 plastic surgeons (42.7%) had websites directly related to their plastic surgery practice. Of those 64, only 15 provided links to any form of social media. All websites contained some form of academic and educational biographies of the surgeon, as well as information pertaining to cosmetic and reconstructive surgical procedures offered by the surgeon. This information provided insight for visitors regarding the indications and technical nature of these procedures. Twelve surgeons had links to a Facebook page (18.75%) pertaining to their practice. Eleven had links to a Twitter profile (17.8%), and only one had links to an Instagram account (1.6%). Thirty surgeons provided information on the year of the qualification on their websites (46.9%). The remainder were ascertained searching for this information from the freely accessible Health Practitioners Council of South Africa (HPCSA) website. The geographical distribution of all one hundred and forty-eight surgeons is described in Figure 1, with the vast majority being in Gauteng and the Western Cape. The average year of qualification for those surgeons who had websites was the year 2000. Table 1 depicts the number of surgeons with websites as a function of the year of their graduation. As one might expect, the number of surgeons who had websites steadily increased as the year of qualification increased. There is a marked proclivity for surgeons from Gauteng and the Western Cape to have an online presence as compared to the remainder of the country. This is possibly related to these provinces being amongst the most densely populated in the country, according to Census 2011 statistics.2 Similarly, Gauteng is also the socioeconomic leader of the country, followed by Kwazulu-Natal and the Western Cape. One may infer that the distribution of surgeons is in keeping with these variables as this is where the greatest patient population requesting plastic surgery may be found. The predominant social media currently being utilised by South African plastic surgeons with an online presence are Facebook and Twitter (18.75% and 17.8% respectively). Professional website usage among South African plastic surgeons was 42.7%. This is low compared to the study by Mabvuure3 which found an online presence of 82% of UK plastic surgeons. A report by Wheeler4 in 2012 quotes that 50.4% of American plastic surgeons were utilising social media. The reasons for this finding in the South African context are not clear and remain a possible avenue for further investigation. "(1) A practitioner shall be allowed to advertise his or her services or permit, sanction or acquiesce to such advertisement: Provided that the advertisement is not unprofessional, untruthful, deceptive or misleading or causes consumers unwarranted anxiety that they may be suffering from any health condition. (2) A practitioner shall not canvass or tout or allow canvassing or touting to be done on his or her behalf. "touting" means conduct which draws attention, either verbally or by means of printed electronic media, to one's offers, guarantees or material benefits." Comparatively, the advertising guidelines as found on the American Society of Plastic Surgeons (ASPS) website allow more freedom in advertising one's practice, either by means of professional websites, or social media.6 It is apparent that the HPCSA's guidelines prevent advertising of one's practice by means of social media and the internet - a ruling which is perhaps prohibitive and outdated in the technologically driven age we find ourselves in, especially when compared with our American counterparts. With regard to the year of qualification and online presence, one notices a distinct increase in the number of surgeons utilising social media around the end of each decade. One may theorise that this is because social media has only become relevant since the inception of these platforms in the mid-2000s, along with the progressively more accessible internet, and concomitant awareness of having an online presence. The average person spends approximately 2 hours per day on social media.8 Worldwide, as of March 2017, there were 1.86 billion monthly active Facebook users. As of December 2016, South Africa had 28.5 million internet users, which corresponds to 8.5% of the total usage for Africa.12 Platforms such as Instagram and Twitter report monthly usage figures of 600 million and 300 million users respectively. These figures are exceptional with regards to the possible reach of a single profile to users around the world. This affords one the opportunity to reach a large audience virtually instantaneously. A study by von Muhlen13 reviewed social media usage amongst various clinicians, and found that more plastic surgeons used social media compared to Australian health professionals, British medical students and doctors, and Spanish paediatricians. Social media has brought the plastic and reconstructive surgeon to within a mouse click of the potential patient/client. Prospective patients are now able to research and choose their preferred surgical procedure -cosmetic or reconstructive - from their homes with the use of the internet. This decision-making process may further extend to selection of the actual surgeon through information that is available online. Potential patients are able to have a "virtual meeting" with the surgeon via the biography which is common on almost all professional websites. Additionally, social media may be used to educate patients on various medical procedures, providing information which may commonly be misconstrued or misunderstood when provided by non-medical sources such as television or print media. In South Africa, the impact of this reach on the practices of plastic surgeons is yet to be fully elucidated. The use of these social media platforms is not without its pitfalls. A systematic review by Dorfman14 assessed existing ethical guidelines pertaining to use of social media, and proposed several guidelines for the use of videos on social media, most of which focus on emphasis through informed consent. Social media affords patients an opportunity to "doctor-shop" over the internet, finding a surgeon which they feel is best suited to their needs based purely on information available online. This precludes individual assessment of each patient and tailoring of treatment accordingly. Personal websites and social media platforms do not necessarily attest to the experience or skill of a plastic surgeon. Websites may inadvertently create false impressions regarding ability and skill. In this respect fancier and more patient-friendly websites may attract more prospective patients to a practice than a website that is clumsy to navigate and provides less detailed information. This may implicitly influence patient preference for selection of a plastic surgeon. A plastic surgeon's online presence in today's age of social media may dramatically enhance their depiction as a professional and expert, regardless of their actual fellowship or years in practice.8,11Rohrich15 suggested that their readers adopt and utilise social media, not just as a trivial request, but to regard it as the future of communication and interaction amongst plastic surgeons. There is a great scope for the implementation of social media in the South African medical community. Social media platforms are currently underutilised by South African plastic surgeons, and developing this would provide an opportunity to interact with patients, as well as to serve as educational tools for professionals and the public alike. While the HPCSA guidelines are currently restrictive, the demand exists to collaborate with plastic surgeons and other medical professionals to develop appropriate local standards to guide social media use and advertising. Perhaps it is time that South African plastic surgeons (and similarly all medical specialists) be encouraged to embrace modern trends and follow suit of their peers worldwide?